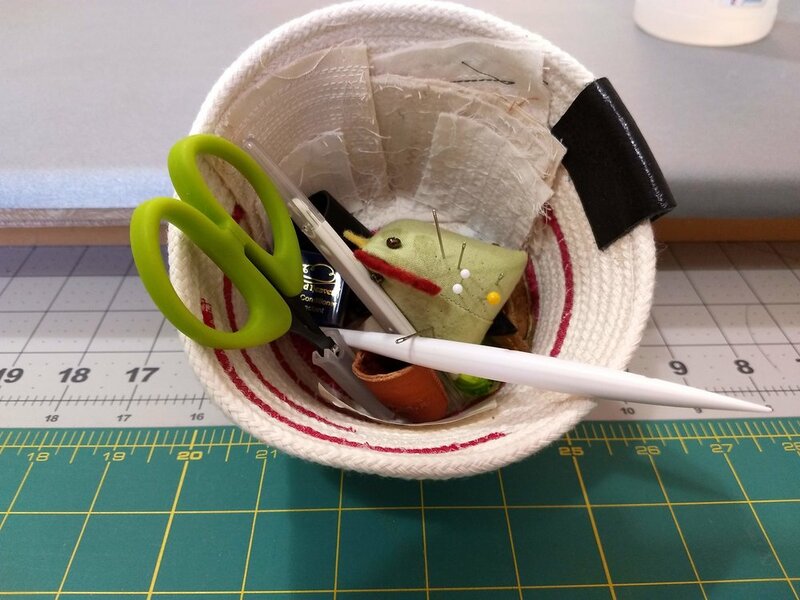 If your New Year’s resolutions include getting your quilting space or sewing room together, here are some great ideas! 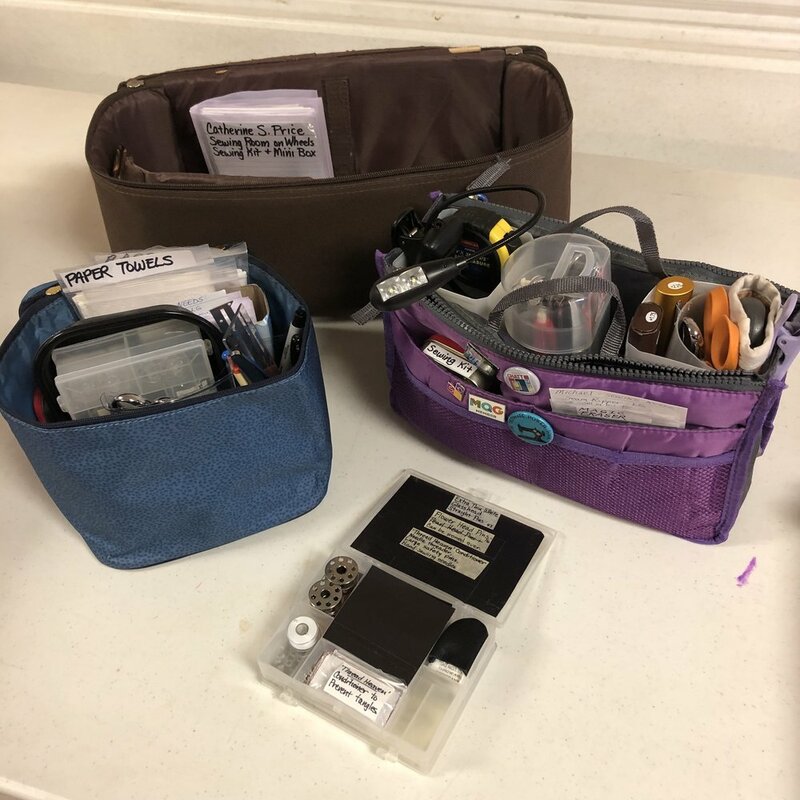 During our January meeting, ChattMQG members shared some amazing and clever tips and tools for getting and staying organized in your sewing space. Just click on the pictures to learn more! At the February meeting, we’ll launch our first challenge of 2019: Set it Free! Bring a fat quarter (or a larger cut) of fabric that you loved or still love but just haven’t used. 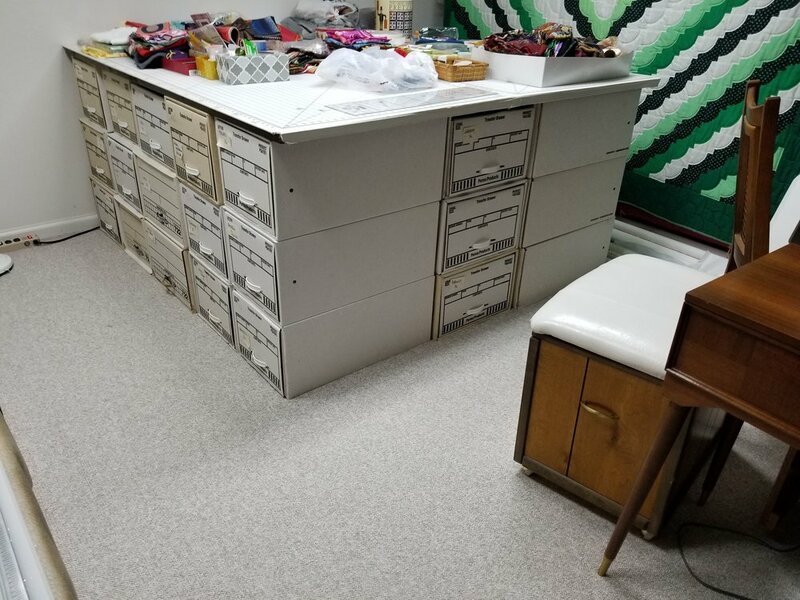 We’ll swap the pieces in a white elephant swap, and then turn them into modern quilts. You’ll have four months to complete your project, for which there are no size requirements. We’ll reveal the quilts in June and celebrate with a potluck party. It’s going to be fun! We had so much fun at our first Handcrafted Happy Hour of 2019, co-hosted by the Association for Visual Arts and held January 15th at the Frothy Monkey in downtown Chattanooga. Members and new friends brought hand work and enjoyed the good company. If you missed it, join us for our next HHH Tuesday, March 12, from 4-7 p.m. in the same spot. Bring a friend! QuiltCon is right around the corner and right here in Tennessee! The Modern Quilt Guild will host the bi-annual convention February 21-24, at the Music City Center in Nashville. Guild members are encouraged to carpool to see the show, which will feature some of our members’ quilts and our modern basket quilt! The annual Stitches in Time Quilt Show show will be at the Museum Center at 5ive Points in Cleveland, TN, from Jan. 31 to Feb. 28, 2019. Two of our large, group quilts will be displayed at the museum February 19-28, as part of a special exhibition outside the juried show. We also have room for a few more small quilts made by members. Karen will be taking the quilts there February 16th and picking them up March 1st. If you’re interested in displaying a small quilt in the exhibit, please bring it to the February meeting. Challenge quilts are encouraged, but any modern quilt will be considered. Our modern basket quilt is finished and on its way to Nashville! The quilt, which was inspired by the book Quilts of Tennessee, will be displayed in an exhibition called Between the Layers: Art and Story in Tennessee Quilts at the Tennessee State Museum starting Friday, February 8. You can read more about the exhibition here. The quilt will take a brief jaunt across town in late February to be displayed in QuiltCon with the other QuiltCon Charity Quilt Challenge quilts. Then it’ll return to the museum for the remainder of the exhibition, which runs through May. Once the show closes, the quilt will be donated to the museum’s permanent collection! Guild members will conduct quilting demos at the museum on Saturday, February 16 and Saturday, April 20 from 9:30 a.m. - 12:30 p.m. each day. Let us know if you’d like to help with the demos by emailing chattmqg@gmail.com. Many of the guild members who stitched portions of the quilt gathered with it prior its departure for Nashville. Thanks to Kelly Spell for organizing the project, quilting the quilt and getting it into the permanent collection at the Tennessee State Museum! Karen welcomed our guests and three new guild members, Janet Eaton, Kaye Laymance and Shirley Van Wieren. Please join us in welcoming them! We’re in the news! Habitat For Humanity mentioned us in their national magazine, Habitat World. Look for the picture of Vanessa presenting one of our quilts to a new Chattanooga-area homeowner. Do you have some books, patterns, fabric or notions that you no longer use or need? Bring them to be exchanged at the meetings. The only thing we ask is that you take them home if no one claims them! 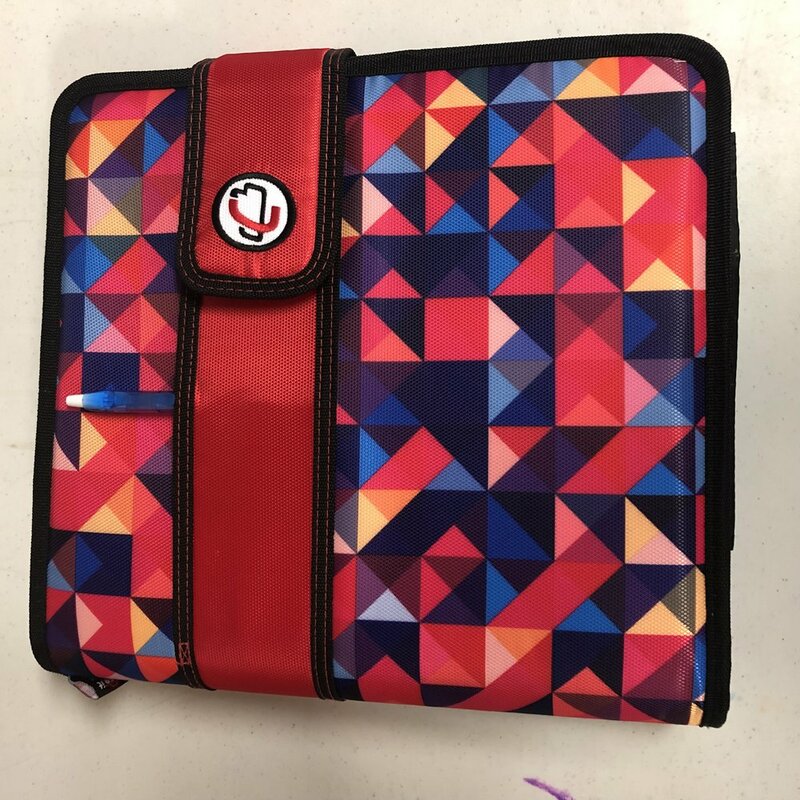 The Modern Quilt Guild has amazing resources on its website. As a paid member, you get access to free block-of-the-month patterns, educational webinars, and more. Take a few minutes to look around the site and take advantage of the offerings. Our own website is also a wealth of information. Search our blog for “tips” or “tutorials” to see some of the ideas shared over the years. Paid members can also access the special ChattMQG Member Resources section of our website, which contains our member directory as well as links to presentations made during previous programs. It requires a password, which Karen sent in an email. If you misplace the password, don’t worry! Just contact Karen at chattmqg@gmail.com and she’ll gladly share it again. It’s time to pay our annual chapter dues. Dues are $35 per member and include membership in the chapter and the national Modern Quilt Guild. It’s a great value! To pay your dues, just bring cash or check to the February meeting. You may also send payment by mail to ChattMQG Treasurer Beverly Herron. For more information, email chattmqg@gmail.com. We had some exciting “tells” this month! Kelly shared that her Cut it Up Challenge quilt, Felicitous Pickle, just back from its showing at the International Quilt Festival in Houston, will hang at QuiltCon and appear in both QuiltCon and Curated Quilts magazines. Jean shared that her quilt, Seaweed, is going to QuiltCon as well! Martha brightened the room with this cheery quilt top made with square blocks and squares with triangle corners. Stephanie made this gorgeous blue/green strip quilt from a Kaffe Fassett kit. Sara made this textured, reverse applique quilt for our #brownbagfabricchallenge It’s made from old feedsacks using a traditional calico challenge fabric and finished with beautiful big stitch quilting. Gail made three mini quilts for our #brownbagfabricchallenge This one, inspired by Sandi Suggs, features embellished buttons and a crocheted yarn border. Gail’s second mini quilt for our #brownbagfabricchallenge features happy daisies and detailed threadwork. Gail’s third mini quilt for our #brownbagfabricchallenge features four cute paper-pieced dogs. So cute! Theresa shared her “Humility” quilt made with batik stars and embellished with a small blue marble to symbolize our small planet in a large universe. This quilt by Stephanie started as a quilt and grew to king size! She made it for her son, who challenged her to finish it. It’s all hand quilted and don’t miss the picture of the shooting star back! We love the shooting star back of Stephanie’s king size star quilt, made for her son. Karen wowed the guild with her big finish this year, a traditional quilt that she started for her daughter 25 years ago! She calls it her “learning quilt” because she learned many techniques as she made the quilt over the years, from complex piecing to applique and beyond. Here’s a detail shot of Karen’s “learning” quilt featuring pieced blocks and hand appliqued borders. Here’s a detail shot of the pieced block in Karen’s “learning” quilt. The white background fabric is her wedding dress. Sigh! Here’s a detail shot of Karen’s hand appliqued border in her beautiful “learning” quilt, made over 25 years for her daughter. Well done! Martha shared two batik quilts in which she experimented with cutting strips into triangles. She used triangle rulers of different sizes (degrees) to achieve the different results. Martha shared a gorgeous rust-dyed quilt project and also shared about the challenges of hand and machine quilting through rust-dyed fabric. She noted that hand stitching is difficult and machine stitching will wear down your needle quickly. The results seem worth it, though. It’s fantastic! Patricia shared her first finish of 2019, a lovely batik sampler quilt! Each block is machine quilted in a unique pattern. Congratulations on the finish! 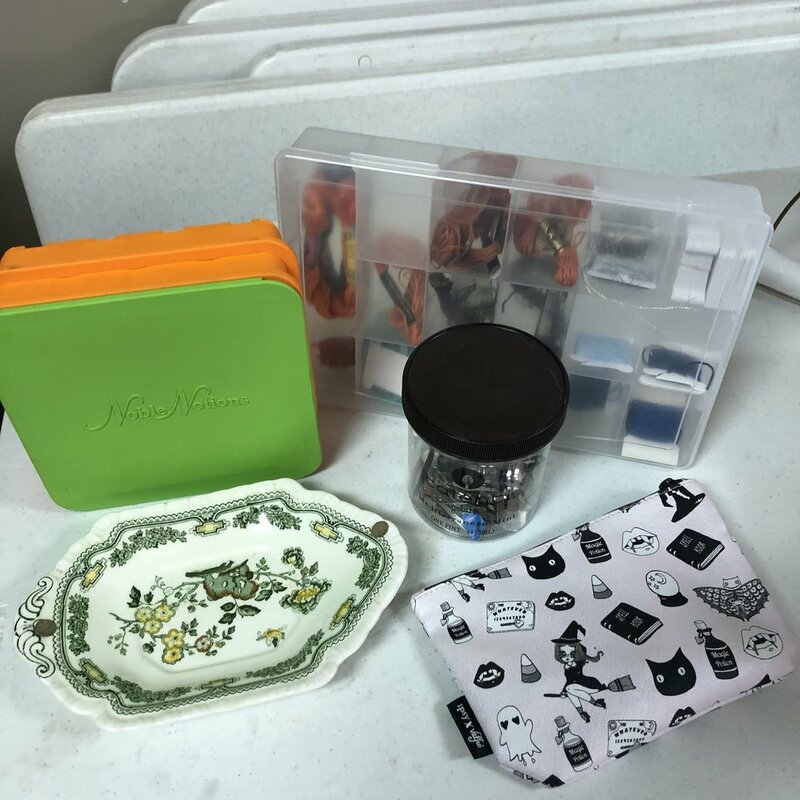 Join us Saturday, February 9, at 10 a.m. and bring a fat quarter (or a larger cut) that you loved or still love but just haven’t used for the Set it Free Challenge. See you then!